Discussion in 'JK Handmade Knives' started by JK Knives, Aug 3, 2018. Still trying to think of some ideas for knives. The idea is to make something affordable that I can still make some profit on. I need to come up with something different to make, just need to figure out what it should be. I do have a design from mqqn that I’m planning on making. I just need more ideas for “entry level buyers”. Problem is materials keep going up which makes it hard to keep prices down. Ok and have you ever done or thought about doing a Pukko style knife with a real basic handle or bare metal? 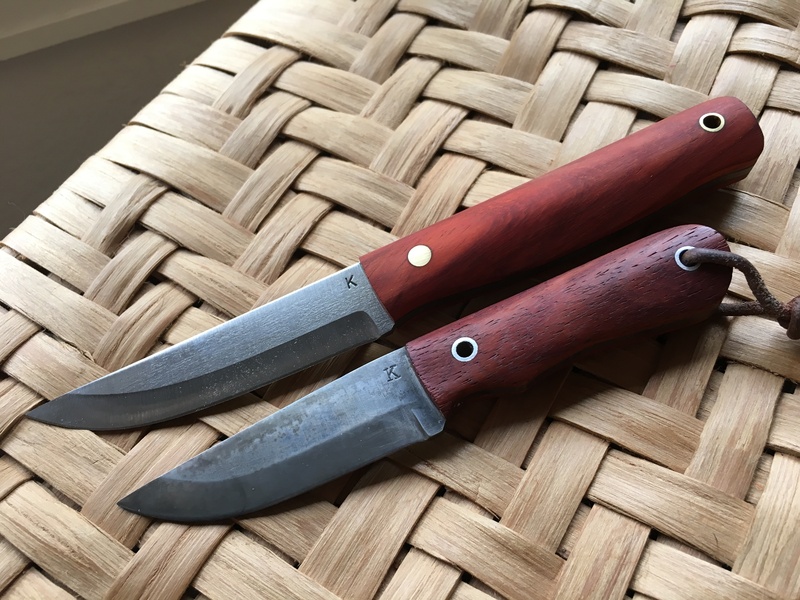 I'v noticed a lot of people are leaning towards that style especially the bushcraft crowd. I know you mentioned stainless being more expensive in general but maybe doing some smaller blades in a cheaper carbon steel if thats possible? Hopefully whoever bought the Puuko I made a few years ago will post a picture. It might have been Cooper? KYenglish and Wurrwulf like this. I believe Cooper has one in tiger maple. Look on the big auction site for keychain self defense tool give you some ideas maybe kubaton,Capos,Munios or something along those lines,I do lots of walking and encounter aggressive people/dogs every once in a while and its an awful feeling to not have any personal protection on you ,so I am always looking for self protection tools thats easy to carry/hide that wont freak people out but will help against possible attack a customized version would be interesting for sure. I know its not a knife, but sometimes it keeps the creativity flowing to change things up a bit,heck i've put together a few Capos from some scrap oak and paracord and they look great used my knife to shape it the way I want to,when your walking alone something is better than not having anything on you. 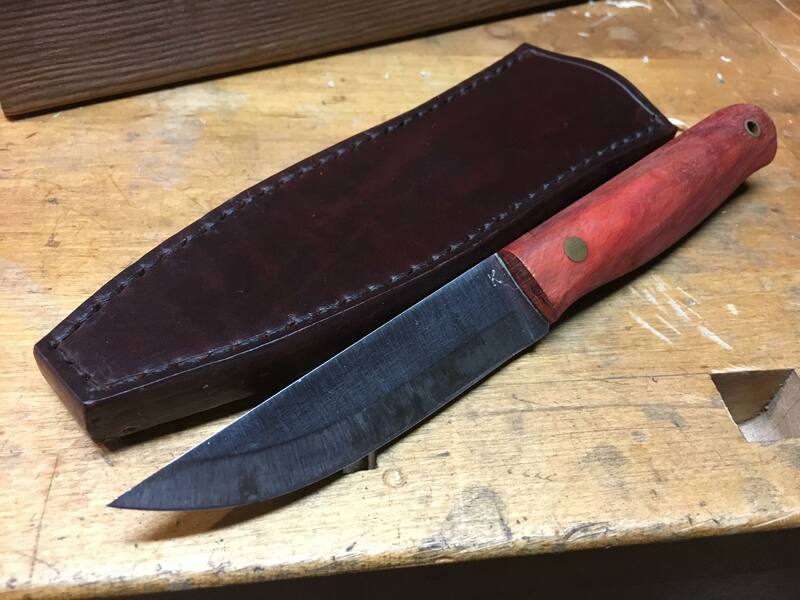 That Puukko is beautiful, Id be game for one if you brought it back! I’ve always liked that puuko. I’m going to have to see if I have the pattern in the shop. If you don’t, I can send it back for reference. Rob Babcock and JK Knives like this. The puuko catches my eye. Looks like a good all around user, that is where I see that pattern being so useful, jack of all trades. Yeah I really like that pukko also! I did find the pattern for the Puuko. ty_higg and Mtblair like this. What are the dimensions? A four inch blade? Whats the blade width on that puuko? About 1” tall and 1/8” thick.